When I was growing up, my Aunt Carole and my mom would always make beef stew; it was just a weeknight staple for us as kids. So with this week's challenge, I decided to tackle our old family standby. I knew that I wanted to revamp the old recipe and add in some new ingredients, as well as try to make it a more time-friendly meal. My new variation is a Root Vegetable Beef Stew with golden beets, mixed rainbow carrots, and chuck roast. I prepped and cooked this stew in 20 minutes, with an additional 20 minutes of “stewing” time to get the meat more tender. This could be made in a dutch oven or crock pot. The root vegetables are roasted in the oven—to give them a deep caramelized flavor—while the meat is browning in the dutch oven, which helps saves time. This stew brings back so many memories of my childhood, and I love the depth of flavor and hint of sweet that the roasted beets add. And the best part about this recipe is that there is plenty for leftovers! Curl up with a big bowl, a good book, and a blanket. Cheers! Preheat the oven to 400°F. 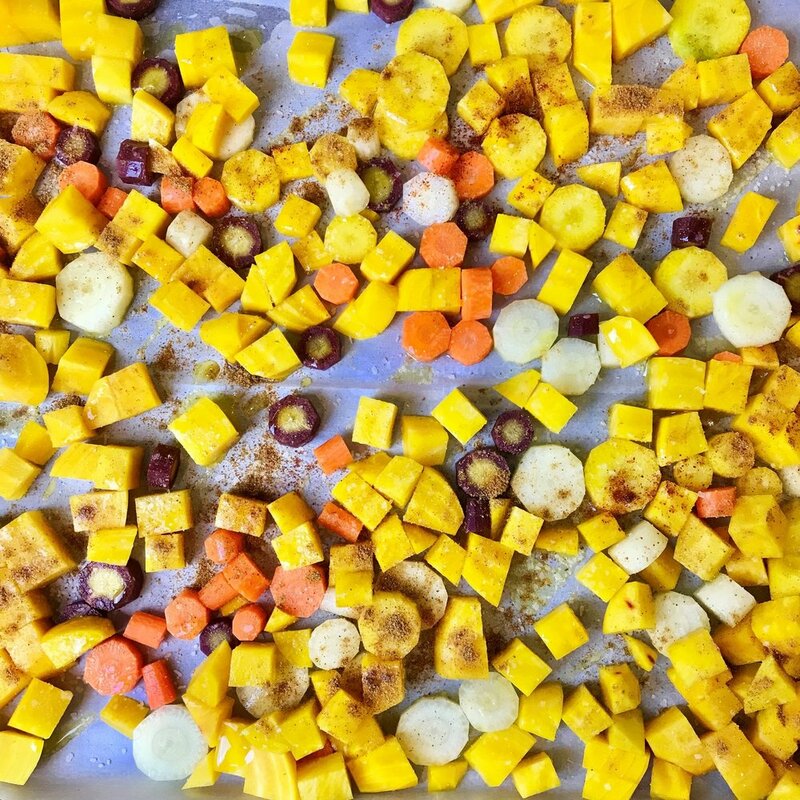 On a sheet tray lined with parchment paper, toss the diced beets and carrots in the oil. Sprinkle the salt, garlic powder, paprika, and cayenne evenly across the veggies. Roast the veggies in oven until they are fork tender—10 to 15 minutes. Heat the olive oil in the Dutch oven over medium-high heat, and add the chuck roast pieces. Sprinkle the meat with the salt, and cook until it is brown on all sides—7 to 10 minutes. Add the onions, paprika, and garlic powder to the Dutch oven, sweating the onions until they begin to look translucent—about 5 minutes. Add the broth or stock, continuing to cook the meat and onions. Once the Oven Roasted Veggies are done, add them to the beef and onion mixture in the Dutch oven. You can continue cooking on low heat for an additional 20 to 30 minutes to tenderize the meat. Or, if you just can’t wait, serve and enjoy!